Check out our building plans here! Posted: Saturday, February 7, 2015 7:00 pm | Updated: 11:30 pm, Sat Feb 7, 2015. The Chabad Jewish Center of Santa Fe has scrapped its plans to build a new facility on its own land and has decided, instead, to remodel a downtown building into a new Center for Jewish Living, complete with a commercial kosher kitchen and cafe. The center will be housed in a 16,000-square-foot, three-story building at 230 W. Manhattan Ave., formerly the home of the State Engineer’s Office. The Chabad Center paid about $1.8 million for the building about a month ago. Rabbi Berel Levertov said the building was purchased from a Holocaust survivor who wished to remain anonymous but was delighted that the structure would become a Center for Jewish Living. The Chabad Center had planned to build its new living center on property it owns at the corner of Galisteo Street and San Mateo Road, and had even rented temporary quarters elsewhere and held a groundbreaking for the project last spring. Levertov said the building is “a prime location” for the planned Center for Jewish Living because it’s in the heart of the city’s business and tourist areas and not tucked away in a residential neighborhood. Levertov said the central location — near the Plaza and just a few streets from the historic Guadalupe District — will make it easier to reach out to nonmembers and visitors to the city. “People could stop in and have some kosher food and cup of coffee or talk to the rabbi,” Levertov said. He said the center’s sanctuary will be on the building’s first floor, and a social hall and kitchen will be on the second floor. He said the center also will have an art gallery, classrooms, a library and a study room. Levertov said the center has budgeted $3.1 million for the project, which includes the building purchase. Levertov and his wife, Devorah Leah Levertov, and their two small children moved to Santa Fe from Brooklyn, N.Y., 18 years ago to start the Chabad Jewish Center and further its mission to inspire people to live a more meaningful life, “and to encourage Jews particularly and people in general to be more involved in spiritual life and goodness and kindness in the world,” he said. Now, at 45, he’s the most senior rabbi in town and the father of six children. The Santa Fe New Mexican ran an editorial, endorsing the New Center for Jewish Life. We feel we agree with them! Diverse downtown Santa Fe will be even more welcoming once a new Jewish center opens on Manhattan Avenue. The Chabad Jewish Center of Santa Fe, which was building a facility closer to midtown, instead will be remodeling a downtown building for its center — complete with a commercial kosher kitchen and cafe. This promises to be a wonderful attraction for visitors and locals, and another inclusive eating option for Santa Fe. Currently, according to Chabad, there are no kosher cafes in Santa Fe. 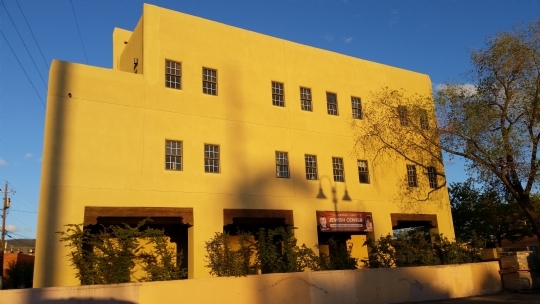 The center, to be located in a 16,000-square-foot, three-story building at 230 W. Manhattan Ave. near the intersection of Sandoval Street, is testament to Santa Fe as a place where all are welcome. It’s also a better place for the center than a residential neighborhood over the long term, as well as being more convenient for visitors. 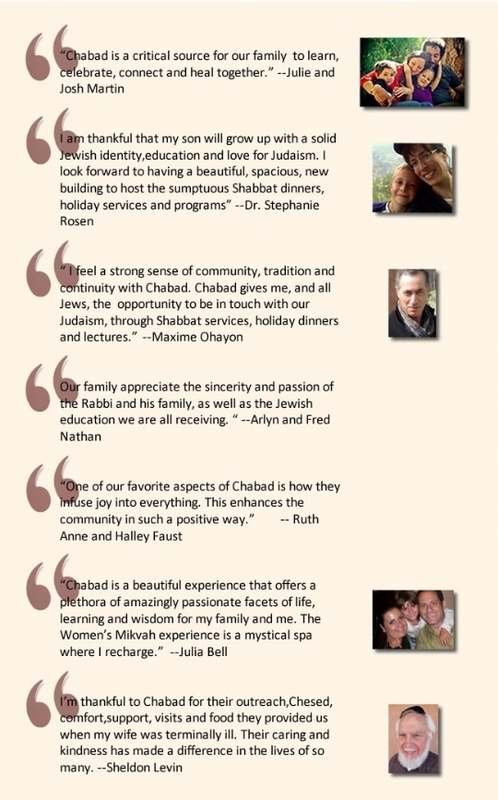 (The current Chabad center, on San Mateo and Galisteo, is located near a school and homes. An expansion there would have brought even more traffic to the busy intersection). That the new center will exist at all is testament to hard work and faith. Rabbi Berel Levertov and his wife, Devorah Leah Levertov, moved to Santa Fe nearly 20 years ago with two small children. They were on a mission to enrich Jewish life in Santa Fe, founding Chabad Jewish Center to inspire people toward a more meaningful life. Today, Rabbi Levertov is in his mid-40s and father of six children, and the center is an essential part of Santa Fe’s religious and cultural life. Every year, citizens see the menorah on the Plaza — Hanukkah on the Plaza is hosted by Chabad Jewish Center — as more evidence of Santa Fe’s acceptance of all faiths. To have a thriving Jewish center so close to the center of town offers a place for questions to be answered, good conversation and a center to worship. The kosher commercial kitchen also might be the first of its kind in Santa Fe, something important both for religious and culinary reasons. Despite Santa Fe’s identification as a majority Roman Catholic town — it is after all, the Royal City of Holy Faith of lhjSt. 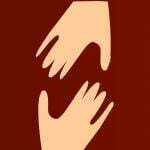 Francis of Assisi — there have been many faiths here throughout its long history beginning, of course, with the Native religions that still thrive. The Jewish faith is nearly as rooted as Catholicism, though. Many New Mexicans embrace the knowledge that their ancestors left Spain after the Inquisition, becoming hidden Jews who kept their religion alive behind closed curtains. In the 19th century, migrating Jewish settlers moved to the United States. Some settled in Santa Fe and founded businesses and services, contributing greatly to territorial Santa Fe. Some of the most prosperous even contributed funds for the completion of Archbishop Jean-Baptiste Lamy’s Cathedral of St. Francis. A Hebrew Tetragrammaton — Hebrew letters signifying the Divine — is carved over the now-basilica cathedral’s entrance. A new center, in the heart of downtown, promises to enrich seekers of all kinds. What a welcome addition to Santa Fe. Construction has begun on the new Santa Fe Jewish Center! View dedication opportunities and donate toward the Building Fund here. The center is being designed by the talented Richard Martinez of Martinez Architecture. Sanctury • Event Hall • Commercial Kosher Kitchen • Classrooms • Library • Kosher Cafe • Judaica Store • Hospitality Rooms • Rooftop Terrace and more! The sweeping 360° views from the building are breathtaking! 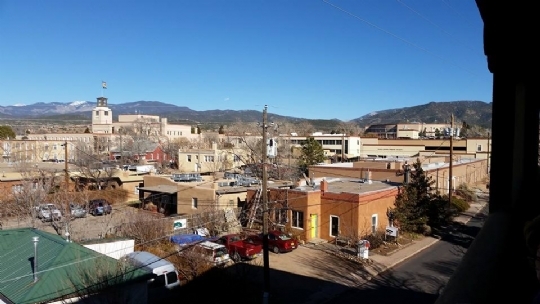 Our State Capitol, Santa Fe Ski Basin, and the Courthouse to the North, The Jemez Mountains to the West, Atalaya to the East will surely inspire the heart and mind! 16,000 sq. ft. center will include: Commercial Kosher Kitchen, Kosher Deli, Sanctuary, Social Hall, Art Gallery, Classrooms, Children’s Playrooms, Library, Hospitality Rooms, Jewish Museum and more! 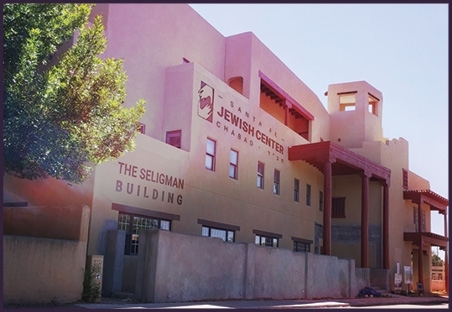 Make this dream a reality with your tax-deductible contribution to the Jewish Center in the heart of Santa Fe and follow its progress at SANTAFEJCC.COM/BUILDING! Located at 230 West Manhattan Avenue.